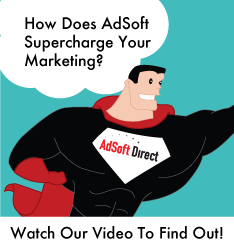 Wes has been with AdSoft Direct, Inc. since its inception and has been a key collaborator in the development of the company’s Campaign Management System® as well as the establishment of AdSoft Direct’s production workflow. His day to day responsibilities include interacting with medium-to-large sized enterprise customers on production, design and enhancement features as well as the continuing development of new company technologies. Prior to joining AdSoft Direct, Inc., Mr. Garlatz founded OHD Creative Media, a successful Graphic Design company in Costa Mesa, CA, which he operated for nine years until joining the AdSoft Direct team. At OHD, he conceptualized, designed and produced national direct mail campaigns for many major corporations in the finance, apparel and food service industries, including Washington Mutual, Inc., Gotcha Sportswear and Hansen’s Beverage Company. Mr. Garlatz is a graduate of the Computer Graphics program at the University of California, Irvine. Beyond being a graphics guru, Wes revolves his live around his family, his wife Joan and two girls as they grow and enjoy priceless adventures.